Fall is in full swing here in central North Carolina. Within the past week, the leaves have almost all turned to yellows, oranges, and reds and they litter our driveway and back woods. To me, this means the time of the year where I don't sleep much. More often than not, I am up before sunrise and headed out to chase largemouths or whitetails. Then it is back to work and wedding planning before doing it all over again. Granted, I don't spend nearly as much time in a tree or my kayak as I wish I did, but I am not alone in that feeling I'm sure. Last weekend was actually a bit of a relief for me. I slept until 8, packed up the car, and headed to a stretch of river I hadn't fished in 3 years. My fingers were crossed that the fall river bite would not dissapoint...and it didn't. I took this picture on a guide trip. Fall sure is beautiful in central NC! I was anxious and excited as I arrived at the launch and started prepping the gear. Shortly after I pulled in, my fishing partner showed up. Jerry is a software engineer at Duke and is slowly becoming addicted to bass fishing. It was his first time every kayak fishing and river fishing - which had us both pretty pumped. After we got the kayaks ready, we had to carry them down a steep, rocky hill, then drag them through the mud, until finally reaching the launch area. The "launch" was an area of cut bank that was less brushy than the surrounding shoreline. Between the loose mud and quick drop, it was tricky staying dry, but we made it. Then came the 2 mile paddle up-river against the current and the wind. But by 10:30 AM we were at our starting spot. On my second cast, a 13 inch bass nailed my chatterbait. I was hoping that would be a sign of things to come. Then I caught another on the chatterbait and Jerry caught one on a black, ribbontail worm. I followed with one on a Deep Creek Lures MT Worm - a flurry that assured us the fall bite had arrived. But the fall bite can be grind, and we soon found that out. The scenery switched from shoals and chutes to slow water and wood cover. I started flipping a Big Bite Baits Fighting Frog. First I caught a 1 lber, then a 2, then a 3, then I lost what looked to be a 4+ lb fish. I told Jerry he may want to switch to the Fighting Frog as well. Shortly after he had his first bite - a giant that managed to use some wood cover to pop the hook. Three casts later and he was hooked up again - this time with a solid 4 lber that he landed and we snapped some pics of before releasing the brute. We caught a few more solid bass between then and 12:30 PM, including another 4 lber, then it slowed down. Way down. It was the epitome of the fall grind. Suddenly I was making 7 or 8 pitches to fantastic looking laydowns without even a nibble. Great looking areas weren't producing anything. We fished hard and the bites we got were savored. I caught a few on the MT worm, a few on the Fighting Frog, and a few on a buzzbait. Finally, I nailed a solid 18" fish on my favorite SOB Lures buzzer and it started to pick up. Jerry proceeded to land a couple buzzbait fish - his first ever on a buzzer. I had a solid fish break me off after wrapping around a log, then I paddled back across the river to fish an area of vines that caught my eye. On my first flip with the Fighting Frog, I felt a bite and set the hook. It was a solid 2 lb bass. I released him and flipped to the next set of vines. This time I felt a bite on the fall and set the hook. I could feel the line tangled around something yet the fish still managed to pull drag. I immediately knew it was big. I paddled over to the vines and could barely see the fish, tangled in a mess of vines and sticks under the water. As he thrashed, I could feel my line rubbing against the sticks. I prayed the 15-lb fluorocarbon would hold. Frantically, I worked to free the line from the mess. Finally, the fish came free and I was able to get her in the net. She was a solid 6+ lb fish and made my day. The rest of the day was decent as we both caught some solid bass. Jerry also caught a couple bream and a crappie and I had a pickerel come loose at the boat. Eventually we started fishing a side channel that I had never fished before. The wind was whipping and I started throwing a buzzbait. I made a long cast to the bank and began reeling. I looked down river to see where the wind was blowing me and then suddenly heard something blast the surface. It sounded like someone had dropped a bowling ball into the water. I turned to see my buzzbait flying sideways through the air. Somehow the fish missed both the buzzbait hook and the trailer hook. I have no idea what type of fish it was, but it was a giant. I tried to throw a plastic back in its direction, but the fish was gone. That is one of those fish I will never forget. The rest of the float was fairly uneventful, other than Jerry losing a healthy 3+ lb bass on the Rapala Scatter Rap. That capped a string of bad luck for us on the day, as we lost quite a few fish that were in the 3-5 lb range. But, sometimes that happens - especially flipping thick wood cover from a kayak. We summed it up as a bad, good day. We caught about 35 fish, had 5 over 4 lbs and a 6 lb kicker, but we lost some fish that would have turned it into an outstanding day. I was impressed with Jerry who ended his first ever kayak fishing trip with his first ever river bass and first ever buzzbait bass. 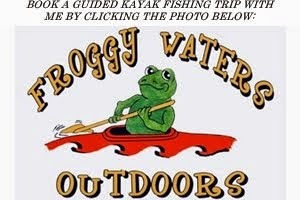 I suspect he and I will be out on the river again in the near future - looking for some redemption. Awesome piece of work for some nice fall pigs!! congrats!! What a day!!! The fall feed bag is definitely on here as well. Jerry must be hooked on the yaks now! Thanks Nick - I think Jerry is already eyeing up a kayak purchase!